Jon was another product of the youth set up at Nene Park, and was the leading scorer in the Under 17’s before stepping up to the Youth team. He was a pacey forward and made two substitute appearances in the Maunsell Cup, but was not offered a contract at the end of his scholarship and was released in May 2006. 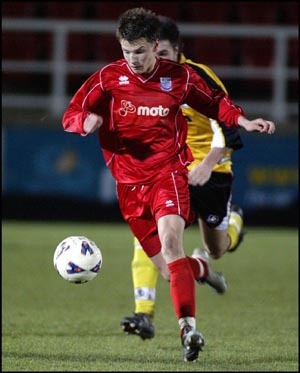 After a trial at Salisbury City, Jon spent periods at Rothwell Town and Bedford Town, before joining Spalding United in the NPL First Division South on 8 August 2008. His stay was short lived and he joined Blackstones of the United Counties League Premier Division in October 2008. On 27 May 2010, he joined UCL Division One side Peterborough Northern Star. After an impressive two seasons at Chestnut Avenue, Jon joined Conference North side Corby Townon 27 June 2012. His stay was short lived however and after a couple of pre-season appearances, he joined UCL Premier side St.Ives Town on 10 August 2012. He left there at the start of 2015 and joined Yaxley shortly afterwards. A long-term injury halted his career in 2017.